A video from the Modern Marketing Partners shows various marketing services available to B2B companies. MMP created the video to bring their services to life while showcasing various B2B (business-to-business) examples of marketing case studies they have completed. 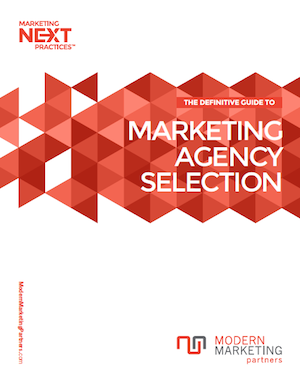 Modern Marketing Partners is looking to expand their offerings to B2B companies and wants to make it known that their agency model is flexible and fits to their needs. MMP has discovered that an integrated approach to marketing is more important these days than it use to be. B2B companies are finding it very difficult to utilize existing traditional marketing activities and syncing them with new, digital marketing methods. If you visit Modern Marketing Partners’ YouTube Channel, you can view videos created for B2B clients. Modern Marketing Partners (MMP) provides comprehensive marketing services and creative execution to leading business-to-business (B2B) brands, in the Chicago region and worldwide. We specialize in the management and integration of traditional marketing, advertising, branding, PR and event marketing with Internet, SEO and social media. Proven approaches that deliver dramatic, measurable results. Please share this post with others interested in B2B marketing by using the bookmarking tools below. Be sure to comment on our video in the comment box too!